It’s common knowledge that Australia has some highly venomous spiders. Whilst some are deadly, most are not very toxic. Despite being very feared, they are an important part of the web of life; controlling insect populations. They have been depicted in aboriginal art and one dreaming focuses on the spider’s sexuality and desire. She would seduce some men and not others and this caused tension and jealousy. To escape the consequences of her action, she turned herself and her lovers into spiders. Be careful of getting caught in your own web. Note, there is a separate tarantula card. I’m going to say from the start, I don’t like spiders, writing this is making me feel things crawling up my legs… I used to, once upon a time. I would play with them and they were all called Humphrey… Then I accidentally saw an episode of a David Attenborough documentary with a spider the size of a dinner plate which could kill you… I was only little at the time and it instilled a fear of all spiders. When I was in Ghana I had to face a toilet full of jumping spiders and in Bali and Cambodia there were some pretty huge ones which I had to scurry past *shudder*. So a hat tilt to Kim who has managed to make this much feared animal still look beautiful. And that’s probably a good first thing to take from this card – all plants and animals are part of the web of life, they all have a role to play and we shouldn’t discount any based on their looks (or their potential to kill). Why is the spider in the earth suit? Surely it makes more sense to be in the air where they build their webs? Well… I am glad you asked! Firstly, not all spiders build webs in the air, some build traps in the ground. But probably more relevant here is the spiders starring role in a number of creation myths. In these stories they literally created the earth, weaving it into existence, so of course the earth suit is the perfect place for them. I think it’s interesting that this spider is weaving a rainbow web – one could take that as a sign of the diversity of life and existence. The web of life is complicated and varied but we all have our part to play. In terms of reflection, how are you creating your reality? There are a lot of things beyond our control but how are you approaching those things which you have influence over? This might be your physical environment, like the spiders web, or your thoughts, like the spider’s persistence. Random fact: Collectively a group of spiders is a clutter of spiders. Most of us know that spiders have 8 eyes and 8 legs, making the number 8 very significant to a spider. In numerology, the number 8 is often associated with balance, something which is crucial when you live on a delicate web! In terms of how it perceives the world, the spider will see the world in intricate and minute detail. And all these eyes must come in handy for the hunters of the spider family. The numerous legs also have a role to play allowing the spider to feel subtle vibrations in it’s web through them. Spiders have a range of approaches to finding food; some trap it in their sticky webs, some lasso it and some hunt it. Regardless of how it gets it, spiders cannot digest solids so they have to liquefy their food first using digestive enzymes. Their hunting approaches have resulted in the spider symbolising patience and persistence, something which is echoed in the nursery rhyme below. Do you need to pay more attention to the detail? Do you need to channel some of the spider’s attitude? Incy wincy spider climbed up the waterspout. However much I don’t like spiders, I do really admire their webs. These fantastic, delicate looking creations are wonderful. Spiders produce silk from their spinnerets which is itself mindbogglingly amazing. It is very lightweight and yet incredibly strong and it’s elasticity – how far it can stretch without breaking – is far superior to that of anything humans have created. This delicate looking and yet architecturally solid web allows the spider to catch large prey in an energy efficient way. And webs are not just the stereotypical design, no, the species have a number of different types of webs depending on the spider spinning it. There is the funnel web, the sheet web, the orb web and more. In religion and mythology, spiders have concealed people by spinning webs over cave entrances, earning them respect in some cultures. 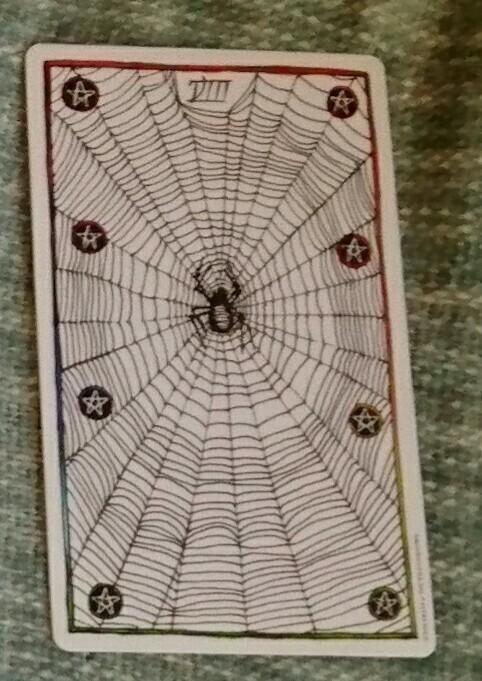 The 8 of Pentacles is an excellent card for illustrating the spiders skills, talents and perseverance. Some spiders have to remake their web daily and yet they don’t complain, they just get on with it. This tarot card is all about honing your skills, carefully paying attention to the details, mastering your abilities, and being focused and engaged in what you are doing. Sometimes it can be asking you to look at your approach to life and other times it can be a much more literal suggestion to make something with your hands.